Home2 WheelersFirst Delhi Bike Pride: Rains, Colours, Wheels and a strong message of equality. First Delhi Bike Pride: Rains, Colours, Wheels and a strong message of equality. While the cloud thundered and it showered in the capital city of Delhi, the LGBTQIA community came out on roads for the First Bike Pride of the city and of the country. 02-July is recognised as a significant date for LGBTQIA community as the High court of Delhi read down section 377 in 2009. This decision was further reversed by the Supreme Court in 2013 but still – the date of 02-July is remembered as the day of victory. 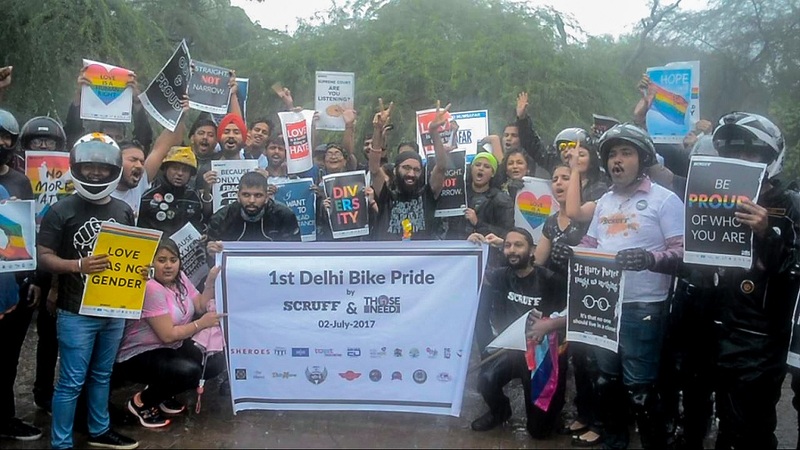 To celebrate this day, SCRUFF & Those In Need came together to organise the First ever Delhi Bike Pride. While it poured heavily, the participants still stepped out of their homes early in morning and became a part of it. The ride began while the participants were drenched completely. This also signified the spirit of the struggle and how this struggle for equality just can not stop – no matter what obstacles are in between. The road was full of colours with smiling faces – riding for equality. A number of organisations came in support of the event and joined for the march. This included not only the community organisations like Humsafar Trust, TWEET Foundation, Indian Aces, Youth LEAD, India HIV/AIDS Alliance, Adhikaar India, Love Matters & Sangini but also bikers groups of men and women like that of the Bikerni, Women’s International Motorcycle Association, Full Throttle, Bikers Paradise, REBC, ROB, Parindey, Turbo Xtreme, Youth Riderz Club and United Spartan Bikers. It was beautiful to see how the allies joined the ride. While many of the allies – both men and women – were riding, a number of community members became the pillion members – signifying how the support of the allies to the community to take the movement ahead. SCRUFF is a global dating, travelling and social networking app for men looking to meet other men. SCRUFF – is a socially responsible organisation and aims to grow with the communities in the country they operate in. Having experienced exponential growth in India, SCRUFF has supported film festivals, prides, regular parties and organised flashmob with the aim to engage and strengthen the Indian LGBTQ community.